Set of 4 LED wax taper candles with 6 Hour Timer. Instructions to turn on/off: -Push flame down with finger until clicks to turn on -Push flame down again to turn off -If left on, will glow for 6 hours then turn off automatically Battery Replacement Instructions: -Pull flame out of wax sheath to reveal metal battery canister. -Twist off white cap counter-clickwise on bottom of battery canister -Replace batteries and assemble in reverse order. 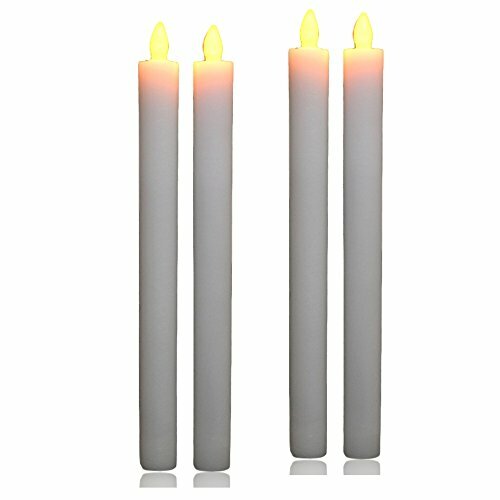 SET of 4 TAPER CANDLES LED wax unscented candles with 6 hour timer. White colored wax with yellow colored LED flameless flickering flame. WEDDING CANDLES. Use for wedding reception parties. Anniversary, Valentine's Day, Christmas or Thanksgiving feast centerpiece decoration. Place on both ends of a fireplace mantel to make a cozy appearance. BATTERY POWERED: requires x2 AAA batteries (NOT INCLUDED). Push Button ON/OFF switch. The flame acts as a switch. Press down on flame with your finger until clicks to toggle on or off. Easy to turn on or off when already set into candle holder. 6 HOUR TIMER turns off automatically.